Send now, $115 through Western Union or Money Gram! As soon as you see the words “Nigeria,” “Western Union,” “MoneyGram,” or anything else that has to do with sending your hard-earned money to Africa, run the other way and don’t look back. While these letters may seem repetitive, I post them here in case anyone who is considering acting on these scams does a Google search. If I can keep a single person from losing their funds to these scumbags, it will have been worth it. Subject: RE: We have completed the Automated Access code number program. Deputy Governor, Central Bank of Nigeria (CBN). We have completed the Automated Access code number program. All we need now is for an attorney from our legal department to sign and we shall give you the access code and the program which your bank or our accredited paying bank near you will use to access the escrow using the password and your will get your funds. Truly, everything is ready to go. It would cost you US$115. The US$115 is to obtain the authorization and legal signing fee of the accredited attorney from our legal department, who will sign to enable us give the release codes to either JP Morgan Chase & Co., Bank of America or BB&T Corporation to enable them access the escrow and pay the first $500,000 installments to you through check, draft or cash. Due to nefarious activities of our corresponding banks and agents, we went into processing, management and online portal services pact with some banks in US. We presently have three claimants in Georgia (U.S. state) and New York, one is from White Plains and 1 is from Ellijay. We set up a secured escrow which can be accessed by and domiciled in JP Morgan Chase & Co., Bank of America or BB&T Corporation for the purpose of these transactions. Once the claimant satisfies the rule, the authorization and legal signing by the Central Bank of Nigeria accredited attorney done, we will give remittance order/authorization to either JP Morgan Chase & Co., Bank of America or BB&T Corporation depending on proximity to the client. Then either JP Morgan Chase & Co., Bank of America or BB&T Corporation will access the escrow using the PIN and password, then update the programmed funds from the escrow and pay it to the client in $500,000 installments through check, draft or cash even through local wire transfer depending on the choice of the beneficiary. The US$500,000 is to bypass bureaucratic bottlenecks and unending money laundering quagmire and brouhaha. Thanks, and we regret any inconveniences you might have passed through. 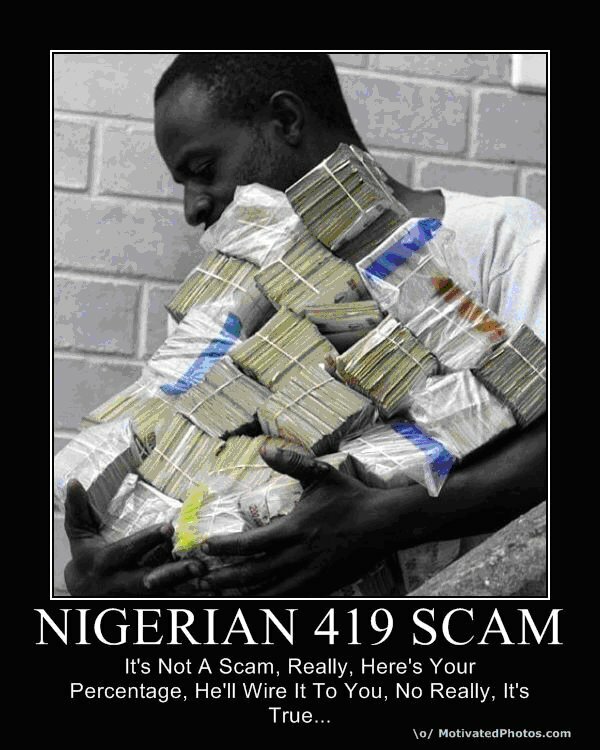 This entry was posted in Fraud and tagged 419, Nigeria, scam, Western Union. Bookmark the permalink.